The Dalai Lama isn’t the first political leaderto join the microblogging phenomenon Twitter, but he might be the first religious leader. Well, the first real one, anyway. His Holiness, or @OHHDL as he’s known on the site, has been networking like crazy, sending 46 updates and accruing 20,000 followers in just two days. Some of it is just sending out links to his other web presences, but there’s a smattering of other stuff, too, including the wonderful statement: “I’m sure HH will be just as inquisitive about technology as he has been over the past 14 reincarnations”. Note: this post nearly contained a “Twibet” pun, but I thought better of it after seeing @natelanxon’s rant this morning. World of Warcraft – a religion? A student from Colorado University has a rather left-field suggestion regarding Blizzard’s insanely popular MMO – it’s a religion. 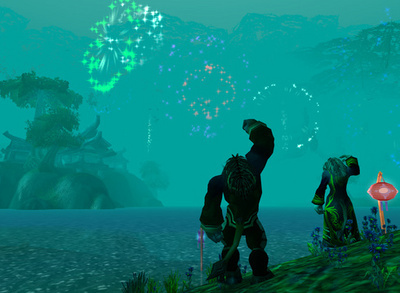 Invoking French sociologist Danil Hervieu-Lger’s definition of a religion as consisting of community, ethics, culture and emotion, Theo Zijderveld determined that World of Warcraft fits the bill. Find out how over the jump. Christian Guitar Hero: Like Guitar Hero but with God instead of Satan as the final boss character? I derive most of my philosophy for life from the film School of Rock. In the film, Tenacious D’s Jack Black plays a school teacher teaches a bunch of school kids about rock & roll, and what it really means to rock out. He teaches them about real values like sticking it to the man and about questioning authority and not blindly obeying it. So it isn’t exactly surprising to learn that a few Christian types take exception to rock & roll – and have labelled it satanic. In the past they’ve even cited l istening to Stairway to Heaven backwards as evidence of satanic messages (presumably because they’ve never listed to, say, Slayer, forwards). Does the Church of England have any rights over a virtual Manchester Cathedral? An almighty row (no pun intended, honest) has broken out between two giants: Sony and the Church of England. It’s all down to the highly controversial use of Manchester Cathedral in Sony’s hit game “Resistance: Fall of Man”. Both the Church, and relatives of victims of Manchester’s gun crime, have condemned Sony for producing the game, branding it “sick” and “highly irresponsible”. Sci-fi it may be (the first-person shooter is annihilating aliens as they dash around the sanctuary toting a huge gun) – and that’s the line Sony is sticking to – but the Church of England is considering legal action if the game is not removed from shelves and if Sony do not apologise. In the highly unlikely event that Sony do remove the game voluntarily from shelves, they’ll be reaching up to the number one shelf position – this controversy will probably just increase the game’s popularity.